Maura Brewer, video still from Jessica Manafort (2018). In late 2018, at the Lincoln Heights art space Queens, artist Maura Brewer debuted her video Jessica Manafort, an onscreen essay about the first multimillion dollar feature film made by the eldest daughter of disgraced former Trump campaign manager Paul Manafort. It’s a smartly edited, wryly comical artwork that pillories the excesses and absurdities of the cultural moment without downplaying their very real stakes. Brewer, who works primarily in performance and video, first learned about Jessica’s movie a year ago. She’d been reading journalist Franklin Foer’s comprehensive feature on Paul Manafort in the Atlantic. In it Foer mentions that Paul Manafort had “invested millions in Jessica’s film projects” and even more in her now-ex-husband’s real estate dealings. “I was so excited that this woman was out there whose film Paul Manafort had basically subsidized,” says Brewer. She wondered what a film funded by a man charged with fraud would look like. “The answer is it looks like any teen movie,” she says. When Remember the Daze came out in 2007, it got terrible reviews (it’s at 0 percent on Rotten Tomatoes) and few people saw it. “This movie isn’t even sophomoric; it’s freshmanic,” wrote the New York Post. “I don’t think it’s as bad as the reviews say it is,” says Brewer, who appreciated the film’s relentless cheerfulness more over time. “In the ways that it fails as a film, it’s actually kind of true to experience, in that getting high with your friends in high schools doesn’t mean anything and [Manafort] doesn’t really try to make it mean anything,” Brewer says. She’s made work about this overlap before. In 2015, she created a video essay about sci-fi blockbuster Interstellar using voiceover and closed captioning to puncture the film’s smugly sentimental father-daughter narrative. Lead actress Jessica Chastain was Brewer’s main subject for several years. A 2016 performance called Sign Here started with Chastain’s feelings about feminism. Brewer’s collaborator, Leah Dutchin, quoted Chastain saying she felt Trump’s election made feminism’s importance clear. “Unbeknownst to [Trump] he is bringing it all to the forefront and I am very grateful to him for doing that,” Chastain told Edit magazine, deferring to the president even while criticizing him. “I think a lot of my work before Trump was about a kind of white feminist privilege,” says Brewer, who believes she’s become more aware of that privilege since Trump took office. Her desire to understand, and critique, such privilege fuels her interest in Chastain and, even more so, Manafort, who calls herself a feminist but has clearly benefited from the excesses of the white male patriarchy her father embodies. The film’s 20-plus-member ensemble casat made repurposing it a challenge, however, and Brewer decided to use the alleged hacked text messages to give the work structure, though she found reading their naked personal details uncomfortable. “It felt gross,” she says, “but I needed a way to bring Jessica Manafort into focus as a character.” In the sisters’ alleged texts, they talk about self-care, entertainment, and their dad, questioning his dealings in Ukraine and even acknowledging their financial dependence on him. 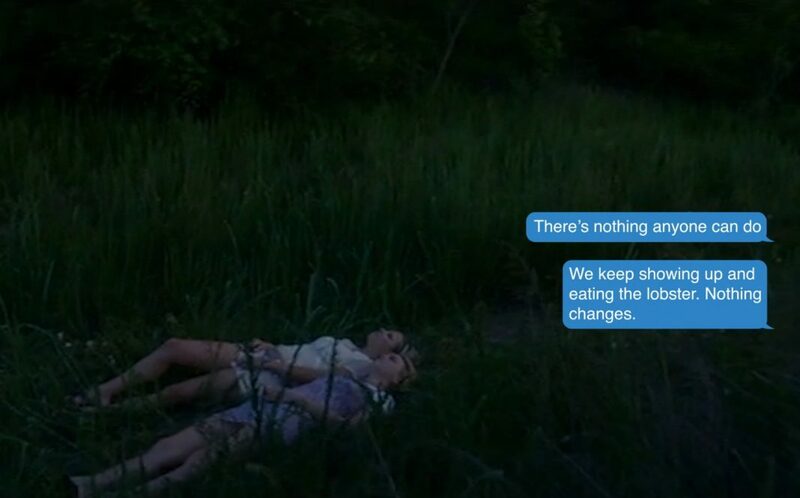 The texts expose Remember the Daze’s luxurious teen moments (waking up under canopies, driving to school in new jeeps) as part of something bigger that’s at once sinister and banal. Jessica changed her name in September 2018, just before the release of her second film, Rosy. The film follows an aspiring actress kidnapped by a socially awkward fan with a very nice house, and Brewer has already begun using it as material for a second Jessica Manafort video. At screenings she’s been accepting “tithes,” and plans to use the money as her own “laundering” fund to use it to buy an artwork and then sell that artwork back, just like wealthy collectors who purchase work from galleries without ever seeing or picking it up, then return it, to clean up their assets. “I’ll do a final performance and use the money to buy a lobster dinner for everyone,” says Brewer. “It does feel like it has to be lobster.